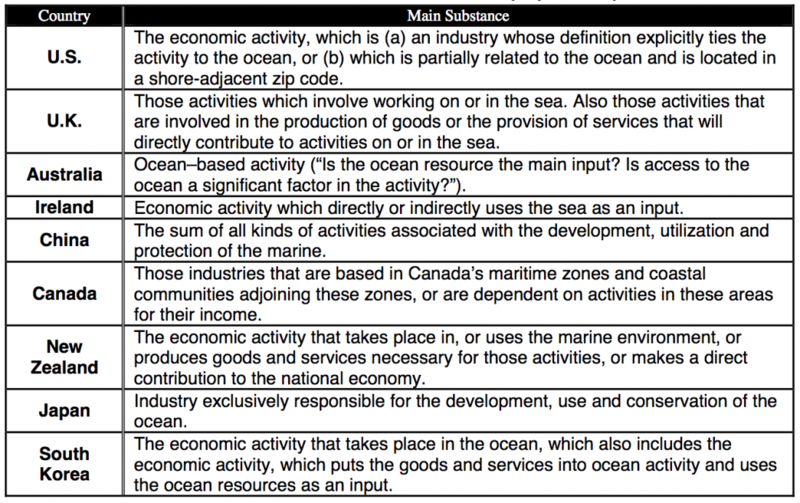 ← Ocean Health Issues – How Do We Measure Health? Last week’s blog about the Ocean Health Index stressed the importance of including the sustainability of human impacts in any discussions about ocean health (this accounted for about 50% of the indexing). This blog will focus on the economic impacts of our declining oceans. For quite some time, I was thinking it would have been convenient if the World Bank had compiled a study of the “blue economy” as a separate indicator that would allow us to do a comparative economic and environmental analysis. We have done similar comparisons with “employment in agriculture” and “agricultural value added” in a previous blog (March 27, 2018). In principle, we can use the Ocean Health Index for this purpose but as yet, it suffers some problematic deficiencies – namely that it focuses on territorial waters and its understanding of “sustainability” is driven by human needs rather than human deeds. The World Bank recognized this earlier omission and published a report on April 6, 2018, focused on some of these issues: “Oceans, Fisheries and Coastal Economies.” It includes some detailed examples of what the World Bank is doing to address some of the specific issues listed below. The data in this section of the report were taken from FAO (Food and Agricultural Organization of the United Nation), which incorporates the UN data on fisheries and other oceanic activities. 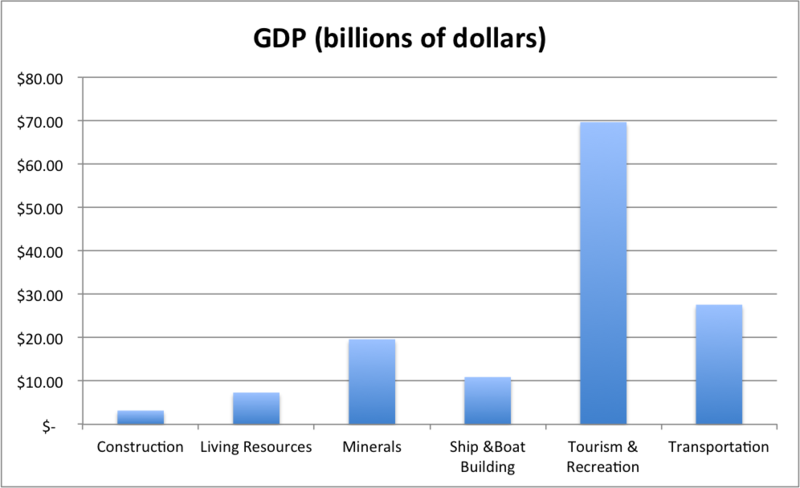 According to the OECD, oceans contribute $1.5 trillion annually in value-added to the overall economy. The FAO estimates that fisheries and aquaculture assure the livelihoods of 10-12 percent of the world’s population with more than 90 percent of those employed by capture fisheries working in small-scale operations in developing countries. In 2014, fisheries produced roughly 167 million tons of fish and generated over US$148 billion in exports, while securing access to nutrition for billions of people and accounting for 17 percent of total global animal protein — even more in poor countries. While ocean resources have the potential to boost growth and wealth, human activity has taken a toll on ocean health. Fish stocks have deteriorated due to overfishing — the share of fish stocks outside biologically sustainable levels rose from 10 percent in 1974 to 32 percent in 2013, while in the same year approximately 57 percent of fish stocks were fully exploited. Fish stocks are affected by illicit fishing, which may account for up to 26 million tons of fish catches a year or more than 15 percent of total catches. In fact, poor fisheries management squanders roughly US$80 billion annually in lost economic potential and 11 percent in catch potential. Fish habitats are also under pressure from pollution, coastal development, and destructive fishing practices that undermine fish population rehabilitation efforts. Oceans are also threatened by marine plastic pollution and each year, an estimated 8 million tons of plastic enter the oceans, with microplastics becoming part of the food chain. Scientists estimate that without urgent action, there could be more plastic than fish in the ocean by 2050. While complex, the issue of ocean plastic waste is a solvable challenge. Five countries are responsible for more than 50 percent of total plastic waste in the oceans (China, Indonesia, Vietnam, Philippines, and Thailand). We also know that an estimated 80 percent of ocean plastic pollution originates from inadequate land-based solid waste management. Proper management of fisheries, investment in sustainable aquaculture and protection of key habitats can restore the productivity of the ocean and return benefits to billions in developing countries while ensuring future growth, food security and jobs for coastal communities. The report highlights the global picture, estimating that the oceans contribute $1.5 trillion annual added value to the global economy (out of $76 trillion in current US dollars); fisheries and aquaculture assure the livelihoods of 10-12% of the world population, with more than 90% of those employed by capture fisheries working in small-scale operations in developing countries. The report also emphasizes that the captured fish secure access to nutrition for billions of people, accounting for 17% of total globally consumed animal protein – a percentage even higher in poorer countries. Going back to the original 2016 FAO report, Figure 1 shows some of the data for the distribution of production of aquaculture. Many millions of people around the world find a source of income and livelihood in the fisheries and aquaculture sector. The most recent estimates (Table 10) indicate that 56.6 million people were engaged in the primary sector of capture fisheries and aquaculture in 2014. Of this total, 36 percent were engaged full time, 23 percent part time, and the remainder were either occasional fishers or of unspecified status. Table 10 in the report indicates 47.7 million people (out of the global 56.6 million) employed in aquaculture activities are in Asia, 5.7 million in Africa, 2.4 million in Latin America and the Caribbean’s and the rest from Europe, Oceania and North America. Converting these numbers to percentage yields: 84% in Asia, 10% in Africa, 4% in Latin America and 2% from the rest of the world. Table 11 in this report indicates that China (30% of Asian fisheries) and Indonesia (13%) are the two largest practitioners. 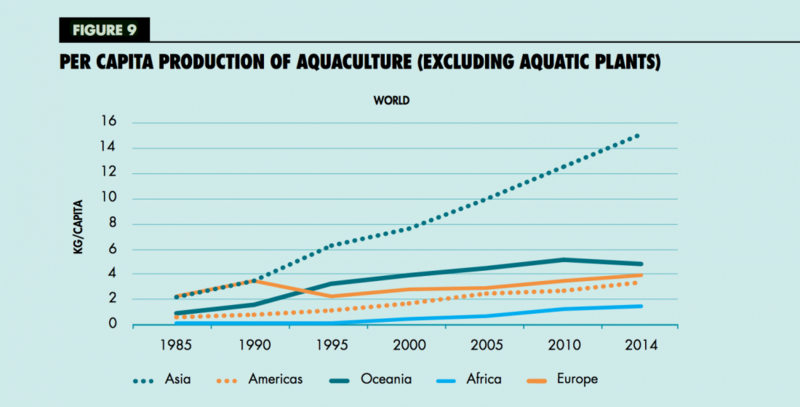 Figure 2 illustrates the changes in global aquaculture production in the context of the increase in global (human) population. 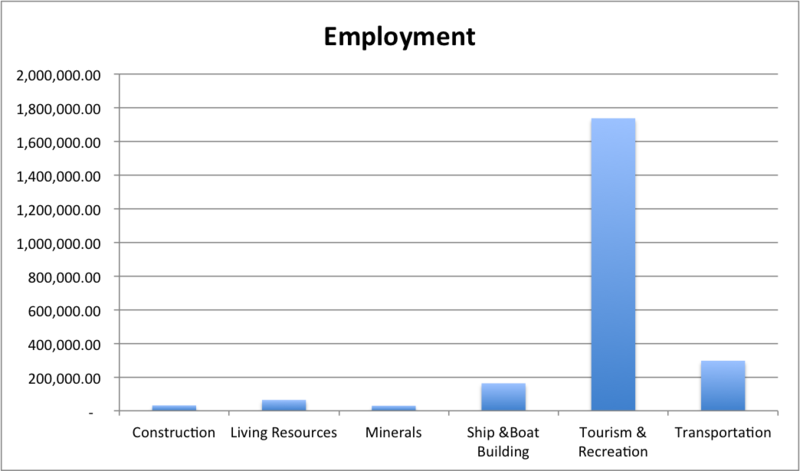 As can be seen in these two figures, the tourism and recreation industries dominate the ocean economy – both in terms of GDP contribution and especially with regards to employment. More data focused on the US ocean economy can be found within a NOAA-financed report. I started this series of blogs focusing on the human impact on the oceans, citing a recent study that attributes the 4th mass extinction to the suffocation of ocean life due to lack of oxygen. The biggest question is what will happen if history repeats itself. If we create similar conditions by raising the temperature, increasing the acidity, exhausting the oxygen content, or combination these inputs within the oceans we will cause such drastic changes in conditions we might eradicate all life within them. Will life on land follow? People all around the world are starting to think about these issues. Perhaps unsurprisingly, most are less focused on decreasing the damage and more interested in how best to harvest resources in the deeper parts of the oceans that have so far been spared most of the destruction. This entry was posted in Anthropocene, Anthropogenic, Climate Change, Sustainability, Water and tagged 4th extinction, acidification, Adaptation, Africa, Anthropocene, Anthropogenic, aquaculture, Asia, Australia, blue economy, Canada, Carbon, China, Clean Energy, Climate Change, Climate Change Denial, Climate Change Deniers, Climate Skeptics, CO2 emissions, definition, Economics, Economy, Emissions, Energy, energy transition, Environment, Europe, export, FAO, farming, Fish, fish farming, fishery, fishing, Food, Fossil Fuels, Future, GDP, Global Population, Global Warming, greenhouse gas, impact, indicator, Indonesia, IPCC, Ireland, Japan, microplastic, Mitigation, New Zealand, Ocean, ocean economy, Ocean Health Index, Ociania, overfishing, plastic, Pollution, Population, Power, Power Plants, Science, South Korea, Sustainability, Technology, Tourism, UK, UN, US, value added, World Bank, World Population. Bookmark the permalink.